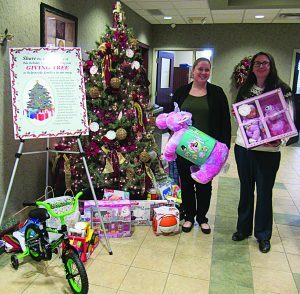 2017 Giving Tree at the Compass Main Office with Member Service Representative, Veronica Blandford (left), and Marketing Administrator, Kelly Sheridan. 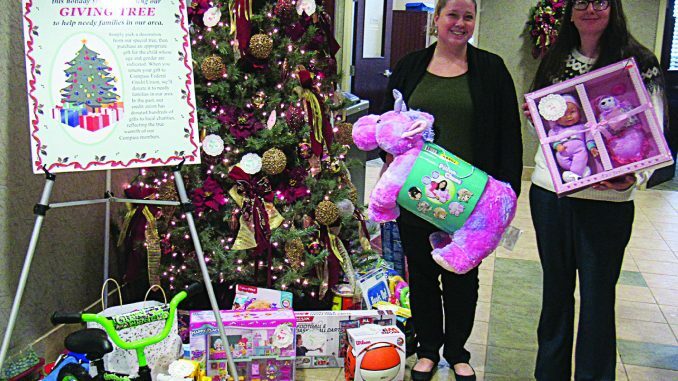 OSWEGO, NY – ‘Tis the season of giving over at Compass Credit Union as it launches its annual Giving Tree program to benefit families in need throughout Oswego County. Through the Giving Tree program, Compass has collected gifts for infants and children up to 16 years old for more than 30 years and would like to invite you to join in the tradition. Unwrapped gifts, batteries, wrapping paper and stocking stuffers such as toothbrushes or hair accessories can be dropped off at any Compass office in both Oswego and Fulton by December 14. All donations to go to The Oswego County Children’s Fund Inc. that serves approximately 1,400 children each year. Visit www.compassfcu.com for a full list of locations. Compass Federal Credit Union is a not-for-profit organization with a focus on helping our members save, borrow and receive affordable financial services. While serving the community for more than 50 years, Compass FCU provides exceptional personal service, security of members’ funds as well as competitive programs. Share the warmth and joy of this holiday season by contributing gifts to theGiving Tree. Visit www.compassfcu.com for detials.